Travis is a passionate person who gives his all to whatever he does. Born and raised in the Mideast (most call it the Midwest) he was an avid skateboarder, then a committed cat-fisherman. 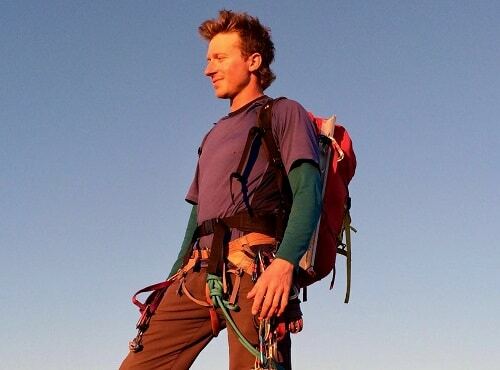 Immediately after graduating with honors in Physics, the mountains beckoned him west where his focus shifted to traveling and then mountain climbing. He keeps life exciting by frequently moving to new cultures and working different jobs. Travis fits in equally well with rugged construction workers in Montana and tutoring young children in Ecuador. To Travis, mountain climbing represents a perfect combination of extreme physical and mental challenges. Mountaineers push their bodies beyond their understood capabilities, but it is intelligence, creativeness, and mental strength that ultimately keep them alive out there. The mountain is also a perfect combination of the most magical and horrible environments known to man. Climbers love the fight through the savage world of ice, and the reward of truly exotic beauty. The program was excellently tailored to minimize climber burnout and maximize acclimatization, giving as many members of the team as possible the best opportunity at being in the best possible physical condition for a summit bid.